Taoiseach Leo Varadkar has joined more than 6,000 volunteers who spent the day on a countywide clean-up of Kerry. Today marked the eighth annual Kerry County Clean Up, with volunteers hoping to take more than 8,000 bags of waste off the roads and open spaces of the county. A total of 330 groups registered to participate in the clean-up, including Tidy Towns groups, GAA clubs and IFA and ICMSA members. The initiative is co-ordinated by KWD Recycling and Kerry County Council. KWD Recycling distributed a total of 22,000 bags and 1,500 high-vis vests to participants. Kerry was the first county in the country to run a dedicated, one-day community clean-up. The clean-up started in 2012, when 500 volunteers collected 5,000 bags of waste. That has grown year-on-year and last year 5,500 volunteers gathered 8,000 bags of waste. One of the event coordinators, Killarney Tidy Towns Committee member Johnny McGuire, said the fact that the amount of rubbish collected was not growing at the same rate as the growth in the number of volunteers is an indication that people are getting the message about littering. 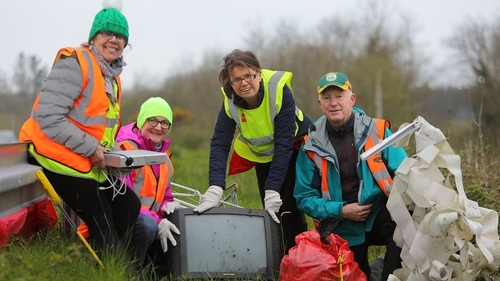 "The growing success of the County Clean Up, since it was established in 2012, is evident in the ever-increasing voluntary effort all over Kerry, and the volume of litter retrieved over the years is indicative of the larger numbers taking part. "Well done to every group and individual for playing their part in this very special grassroots initiative which aims to maintain Kerry's very valuable reputation for tidiness and cleanliness."